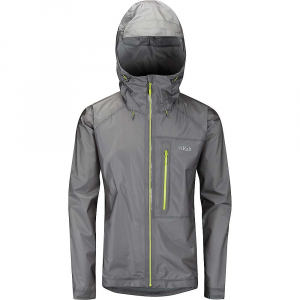 The ALPS Mountaineering Nimbus is a rain jacket that I’ve found to be waterproof and also very breathable. It’s cut a little large for layering. 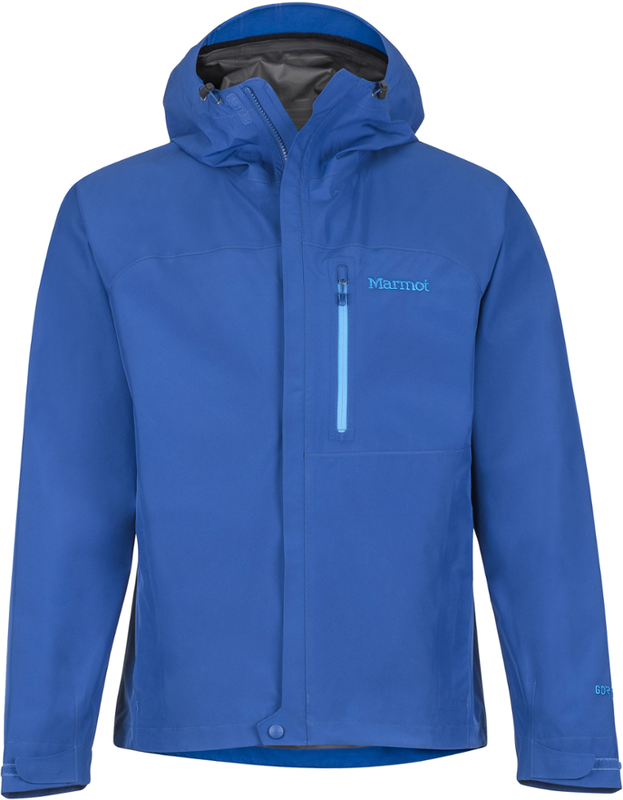 Disclosure: I enrolled in the ALPS Mountaineering product review program, bought the jacket at MSRP, and received a 40% off MSRP rebate for my first review with a further 20% off MSRP for my second, for a total of 60% off MSRP. I bought my ALPS Mountaineering Nimbus Jacket a couple years ago mainly to wear while deicing aircraft. 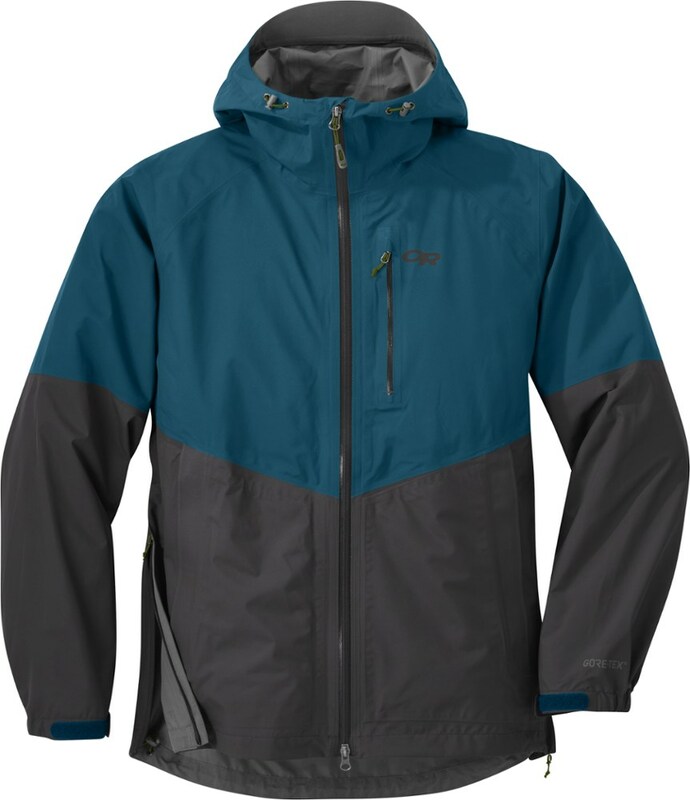 The price was right - a total of 60% off MSRP after writing a preliminary and final review - and I didn’t have to risk damaging either of my more expensive EMS rain jackets. It has plenty of room for a fleece or heavyweight Carhartt sweatshirt underneath, but isn’t excessively big on me when I wear it over a lighter layer. I tend to like my clothes a little loose anyway. I’d never really worn it for anything but work, until the other night when I had it in my Jeep after washing it. I was heading out to a local trail for about an hour of snowshoeing, and decided to wear it over my mid weight Merino shirt because it was a little chilly due to the temp and high humidity—what I call “southern cold” that penetrates all your layers. After about half an hour I realized that I wasn't soaked in sweat even though I’d never unzipped the jacket. I could feel a little bit of moisture under my arms and on my chest, but was mostly dry. In much colder temps both of my EMS rain jackets and my ECWCS parka would have had me drenched. I decided to pick up the pace a little and see what happened. The second circuit was much like the first, I was a little more sweaty but not even close to being uncomfortably so. The jacket itself seems to be constructed very well, the material is thin and drapes well. 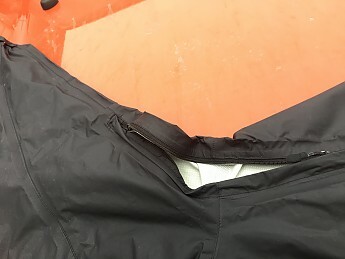 The zippers move smoothly but will snag due to how thin the material is. When zipping up it‘s easiest to pull the fabric tight from the bottom. 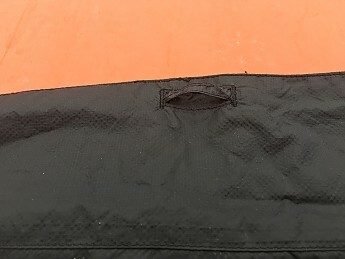 The zipper has a single pull, with a storm flap secured by Velcro spots and snaps at top and bottom. Sleeves have Velcro cuffs. Pit zips go from mid-torso to just short of the elbow, and can be closed easily while wearing if you raise your arm to give a straight pull with a little tension. The two hand pockets are large and have a mesh lining, which is where I think a lot of the breathability comes from. With my gloves in the pockets I zipped them up for security, though, and didn’t really notice a difference. 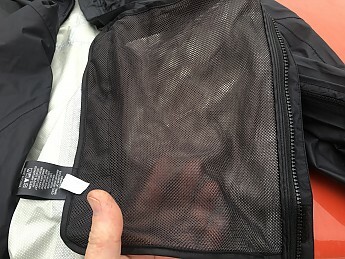 The mesh lining is attached at the median so the pocket doesn’t just hang loose, but the bottom isn’t sewn to the jacket. This is unfortunate since they’d make great interior pockets for gloves, etc. I may have them sewn down and apply seam sealer. The zippered chest pocket is odd since the zipper is oriented horizontally rather than the usual vertical. Pocket size is good. My iPhone 6S Plus fits with no problem closing the zipper. There’s no port for earbud wires. 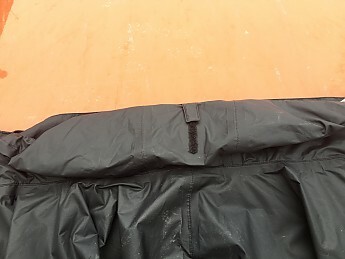 Hood adjustability isn't that great—two drawstrings close up the face opening and a Velcro tab on the back of the head shortens it fore and aft. There’s no side-to-side adjustment. The brim is very floppy, with absolutely no stiffness at all. It generally ends up in front of your eyes when you cinch the face opening. I may try making a stiffener out of a thin sheet of plastic sometime. 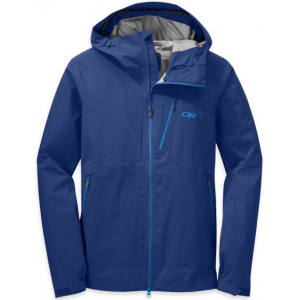 The hood rolls up and stows in the stand-up collar, there’s no closure so it just sits in there. EDIT actually there is a way to secure the rolled-up hood, what I thought was just a hang loop is a loop for the Velcro hood adjuster tab. 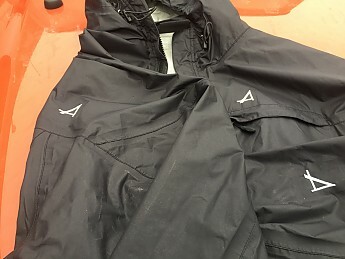 There are three embroidered white “A” logos on the jacket—left chest, left sleeve cuff, and back of right shoulder. This is too many. All in all I like the Nimbus mainly for its breathability. 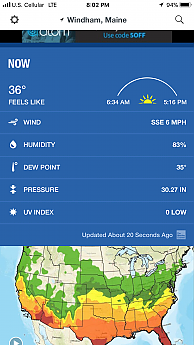 I’m VERY warm-blooded and wearing a jacket of any kind if the temp is much over 10-15°F usually results in excessive sweating with any kind of exertion. I don’t know what it would be like if I was hiking a mountain, but I think I’ll try it out next time I go. I wouldn’t pay the full $100 MSRP for the Nimbus, but the $60 it cost me after ALPS Mountaineering received my first review was definitely a fair price IMO. The $20 rebate after my second review was even better. Now I wish I’d gotten a color other than black! 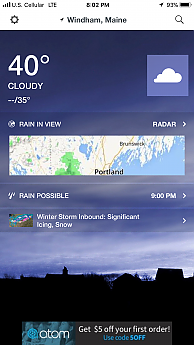 I like that part about the Southern cold, hahaha! I've long held the opinion that the hardest temperature to deal with is 0-5 celsius (like 32 to 40f) and high humidity or rain. WAAAY easier in my opinion to be warm at -30c, id take that anyday over a few degrees and rain. It was like 3 degrees celsius here today and I had a wool base layer, a down vest and a gore tex shell and i was still cold! My term for rain in 5-10C temps is “good army weather” because it seemed those were the conditions most of the time during field exercises. Being wet and cold, usually with dirt and sand ground into your clothes and skin, for an entire week or 2 is just miserable. During one stretch of good army weather I became hypothermic from doing all the work necessary to move to another area in a cold rain without any rain gear, because rain gear over a chemical suit is a good recipe for a heat injury. All I could do was sit and shiver uncontrollably in the cab of a truck with a heater that made the one in a VW Bug seem efficient by comparison. You'd think a 5 ton truck or a Humvee would generate enough heat to warm a small building, but yeah, those heaters are the worse! Sounds like a good value rain jacket at that price point, don't know about the full $100 though. 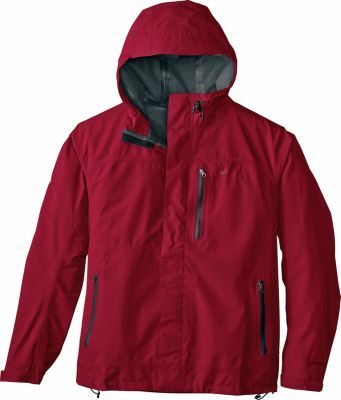 I think my Red Ledge was $60 and the hood, brim and pockets are just right. What's the weight on the jacket, Phil? Thanks for the review, Phil. 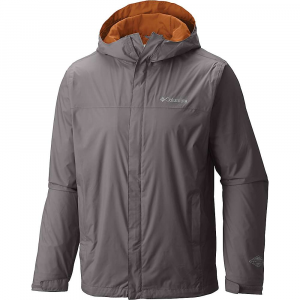 The ALPS Mountaineering Nimbus Jacket is not available from the stores we monitor.